Hello Steemit community. I've been scrolling through some introductory posts to find out what is expected of me. It seems I should just be myself. I'm more accurately described by why I do things than by what I do. Curiosity and persistence are my driving traits. I've written many books. These cover wide-ranging subjects: science, art, writing, history. I'm not a techie, but will not be ignorant about technology. I was an early owner of a Sinclair personal computer, although I had never taken a course in computers. My participation in Steemit is a natural extension of my curiosity. The community offers open access to people from all backgrounds and perspectives. Sounds exciting to me. 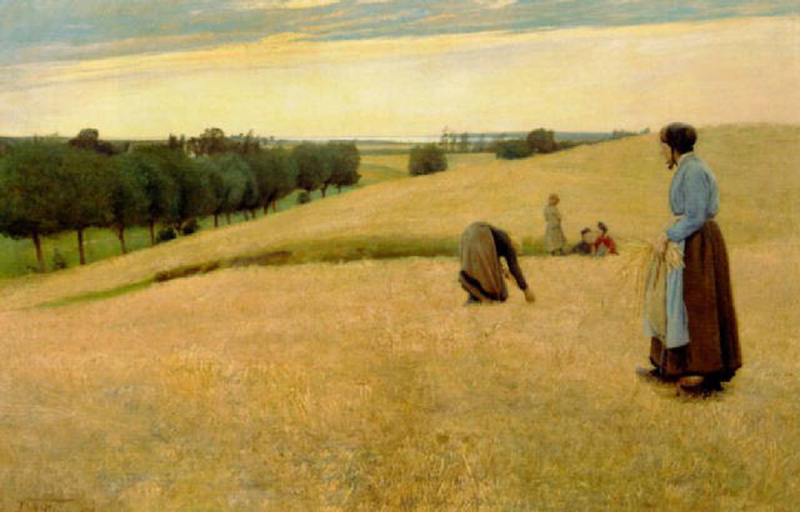 The featured photo on this page, "Gleaners", was painted by a Danish artist, L. A. Ring. Discovering Ring has been a recent reward for my curiosity. Learning about his art was incidental to something else I was doing. He is little known outside of Denmark, and yet his work makes me catch my breath. I'm going to write about him, because I think a lot of people who never heard of him will be similarly moved. My profile pictures shows two loves of my life, Kiara and Rosie. Over the last few years I've found the number of rescue animals I support increasing. Kiara was adopted from a shelter and Rosie from a car engine. Family members help to care for these animals. I look forward to reading posts from people all over the world, even if these are written in languages that are not native to me, especially Spanish, German and French. I hope to be an active member of the Steemit community. Hi. I also just joined. We apparently have two things in common: (1) I also write-science fiction in my case. (2) Though I haven't actually owned a Sinclair computer, one of my good friends built the kit version of the first Sinclair computer that made it to the states and he was nice enough to let me play with it quite a bit back when home computers were expensive. I hope you enjoy steem. I love science fiction, though in recent years I tend more to nonfiction, mostly history. Sinclair was a trip. Thanks for the welcome. Welcome to Steemit! "Just be yourself" is great advice. Looks like we joined at about the same time. Welcome, @agmoore! You seem a very interesting personality. Have any of your books been published publicly? :) I wish you best of luck on Steemit. Thank you! I have self-published all my books. Some of them actually sell :) I will visit your channel. Thank you! Getting use to the environment. Very interesting.